Bicycle sharing is part of a larger sharing movement known as Collaborative consumption. The basic idea is that there is a large pool of bicycles stationed at various stations across a city and for a modest fee users can ride for extended periods (maybe all day in the case of a tourist) or for shorter point to point journeys (an office worker travelling from train station to office). The largest and most successful is Vélib’ in Paris with 20,000 bikes available for users with swipe-cards at 1,639 stations, roughly one station every 300 metres throughout the city centre. Paris’s system has about 120,000 trips per day, so on average each bike is used 6 times per day – which is quite extraordinary. The fee structure is cheap (even free) for short term use (<1 hour), then ramps up very quickly – emphasising the focus on short trips – quick turn-over. There are a wide variety of systems now in use and this wikipedia article on the Vélib’ provides a great description of the issues. Of course there is a dilemma. What if there are two stations equidistant from your office – it is peak hour and you don’t want to head to the station that has no spare bikes. Easy – just go to a data mashup site that lets you see how many bikes are available at each site. Check this one out – I need a bike mash-up. Clever, useful stuff. Not so much the world wide web, more the around the corner web. The other model that has been growing rapidly is Bixi. 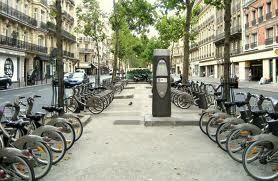 The Bixi system was launched in May 2009 in Montreal. This was followed by operations in Melbourne, Australia from May 2010, Minneapolis (MN), (the first on U.S. soil), in June 2010, and London in July 2010. Early feedback is that London is booming – over 500,000 bicycle trips were made within the first six weeks of the launch of the scheme. A report on the first 3 months of the Minneapolis Scheme is available here – (65 stations operating with 600 bikes on the street – 57,645 trips). The Melbourne Bike Share Program doesn’t seem to be going so well. As of July 2010, fewer than 70 trips are being made a day on Melbourne’s 600-bike system – a very poor take up rate. The two main problems seem to be the “network effect” (i.e. it is more effective with more bikes and more stations) and the helmet problem. Australia is one of the few countries in the world with almost universal helmet laws. Danish urban planner Mikael Colville-Andersen made the following observations. He said Melbourne had to move from a bicycle culture focused on ”the Lycra set” to making cycling part of people’s daily transport. And compulsory helmet laws had not been picked up by other countries after Australia introduced it in the 1990s, he said. ”Good ideas tend to travel and this idea, that you simply must wear a helmet when you cycle, has not. What does that tell you? As an aside – the helmet issue is an interesting one. What are the risks of injury versus the health benefits ? This site Cycle helmets.org for the discussion. Recently Mexico and Israel have repealed, modified their helmet laws – at least partially to help make their bike share schemes work. My personal stance on helmets – I think that they should be compulsory up to age 14, then optional. I think that we should remove obstacles to people riding bikes – plus they mess up your hair. 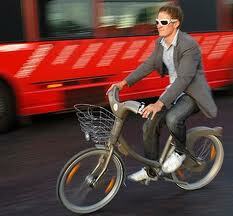 To see how uber-cool cycling is (without helmets) – check out Cycle Chic. Note on the Vélib’ funding deal. The system is financed by the JCDecaux advertising corporation, in return for the city of Paris signing over the income from a substantial portion of the on-street advertising hoardings.